Demonstrate your compassion and commitment to canine health. 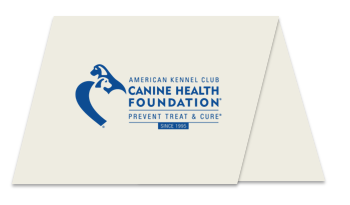 Honor or memorialize a special dog or person with an AKC Canine Health Foundation tribute card. AKC Canine Health Foundation will send a card announcing your gift. Your donation helps support canine health research and provide educational resources to dog lovers everywhere. To send a tribute, please click here. To send a tribute card print and mail our tribute form to AKC Canine Health Foundation, PO Box 900061, Raleigh, NC 27675.